William Gropper, Politico from the portfolio The Capriccios (1953–56), lithograph, image 14 x 10 inches, sheet 16 1/4 x 12 1/4 inches. Image courtesy the Mary and Leigh Block Museum of Art, Northwestern University, Gift of Evelyn Salk in memory of her husband, Erwin A. Salk, 2001.21.43. Gropper pleaded the Fifth Amendment to the first question, “on the grounds that I might bear witness against myself.”3 A committee counselor then asked if he were the “William Gropper who has prepared various maps?” The wording (devaluing Gropper’s well-established reputation as a painter and printmaker) implied that Gropper was some kind of covert cartographer for the Soviet Union. Although linking the innocuous Folklore painting to espionage was less Orwellian than Swiftian in its comical incongruity, McCarthy had in fact good reason to suspect Gropper of Communist sympathies. The Folklore “map” gave McCarthy a convenient excuse to extract testimony from arguably the highest-profile artist of the American Left. By 1953 Gropper had been for almost three decades an ink-dripping thorn in the side of the “ruling class,” puncturing and deflating the egos of politicians, capitalists, dictators and emperors. Gropper had achieved commercial publishing success in the 1920s and ’30s with regular illustrations in Vanity Fair, Vogue and The Nation. A 1935 caricature of Japan’s Emperor Hirohito for Vanity Fair caused an international scandal; copies were impounded in Japanese ports.4 Gropper was equally controversial in his prolific, though less lucrative, career as a cartoonist for radical leftist journals such as Liberator, Freiheit (Freedom), Rebel Worker and New Masses. His work for these publications— scathing indictments of worker exploitation, militarism and racism, and vicious caricatures of bourgeois capitalists, power-drunk cops and blowhard congressmen—brought him to the attention of the FBI, which opened a file on Gropper in 1941.5 He had been involved since the 1920s with organizations categorized by the FBI as potentially “subversive”—the John Reed Club, the Artists’ Union and the American Artists’ Congress—which intensified the bureau’s scrutiny of him through World War II and into the Cold War. William Gropper, Piece Work from the portfolio The Capriccios (1953–56), lithograph, image 14 x 9 5/8 inches, sheet 16 3/16 x 12 inches. Image courtesy the Mary and Leigh Block Museum of Art, Northwestern University, Gift of Evelyn Salk in memory of her husband, Erwin A. Salk, 2001.21.41. Gropper’s invocation of Francisco de Goya, the patron saint of artists invested in print as a political medium, suggests the scope of his ambition. The eighty etchings of Goya’s Los Caprichos (1797–1799) skewered the aristocracy, the clergy, the vanities of women, the worldly pride of men and the superstitions of the common people, los pueblos. 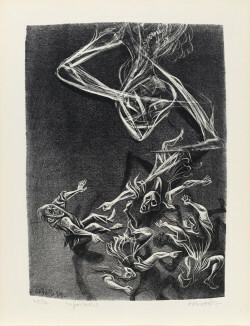 In his free interpretation of Goya, Gropper drew a provocative parallel between inquisitorial Spain and 1950s America: in both places hearsay, sham trials, false witness and abuses of power ruined reputations and destroyed lives. Excepting the occasional maja or witch, Gropper seldom refers explicitly to Goya’s series. Instead he pays homage through his use of print’s expressive powers and his blistering critique of institutional abuses and injustices. His Capriccios offer a vivid, historically specific response to McCarthyism, “the Inquisition of our times,” as he put it. That emotional impact is due not only to technical virtuosity but to intensely personal content. Gropper refers, for example, to New York’s Lower East Side in the early 20th century—the crucible of poverty and exploitation in which his radicalism was forged. Born in 1897 to Jewish immigrants from Romania, Gropper grew up in a grim, ghettoized world of tenement housing and sweatshop labor. His mother, a seamstress, worked long hours for little pay in the garment industry. As Gropper later wrote, “The sweatshop gave us our livelihood but robbed us of our mother.”10 This early conviction that his mother was a victim of oppression and profit-mongering shaped his future politics. William Gropper, Playmates from the portfolio The Capriccios (1953–56), lithograph, image 14 1/8 x 10 inches, 16 1/4 x 12 1/4 inches. Image courtesy the Mary and Leigh Block Museum of Art, Northwestern University, Gift of Evelyn Salk in memory of her husband, Erwin A. Salk, 2001.21.42. Piece Work depicts just such a sweatshop. Workers hunch over their machines, parceled out in a long line. 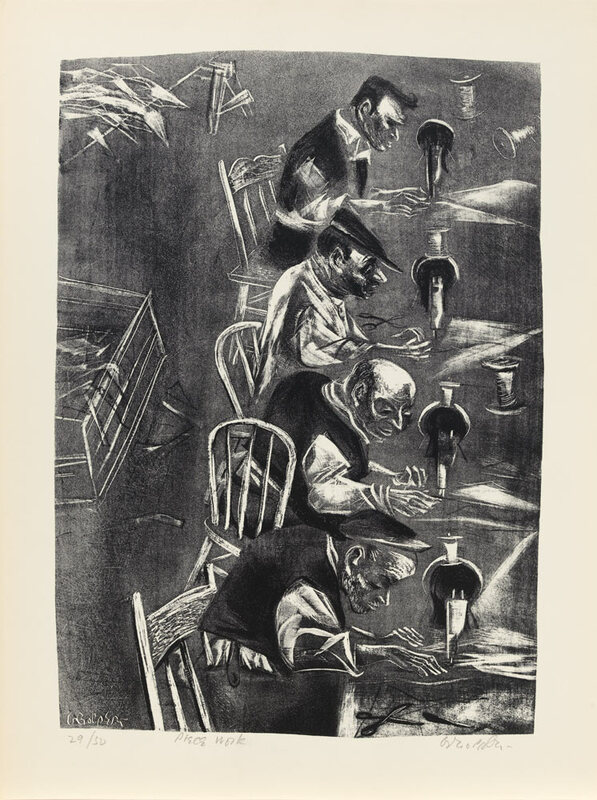 Gropper’s experience as a cartoonist accounts for the print’s loose, wrist-flick draftsmanship, distorted perspective, and heightened expressivity. The contorted limbs and exaggerated features of his figures, in tandem with the charged social criticism, call to mind George Grosz and the influence of Germany’s Neue Sachlichkeit on American leftist artists in the 1920s and ‘30s. Throughout the Capriccios, however, Gropper reserves his Grosz-like savagery for depictions of generals, politicians, judges and robber barons (as in Patrioteers, which features a torch-wielding lynch mob of Groszian cowboy sheriffs and war veterans). His pieceworkers, by contrast, are given poignantly specific physiognomies. Gropper knew these men and women well; he himself had worked as a “bushel boy,” a child laborer shuttling fabric between the warehouse and home workshops. At Manhattan’s Ferrer Center, one of the “Modern Schools” established in the early 20th century to educate the working classes, Gropper found a ferment of labor activism and socialism with ties to the anarchists Emma Goldman and Alexander Berkman. Lozowick remembered the school as an “indiscriminate fraternity” of “‘wobblies,’ bohemians, sailors on leave, society women, hoboes, fanatical idealists, and unscrupulous self-seekers.”11 Visitors and guest lecturers included John Reed, “Big Bill” Haywood, Jack London, Margaret Sanger and Upton Sinclair. Marcel Duchamp dropped in occasionally to play chess. Several of the Capriccios reveal his cartoonist’s knack for summarizing complex social injustices through succinct, laden narrative. Playmates is a hauntingly cynical song of innocence and experience. 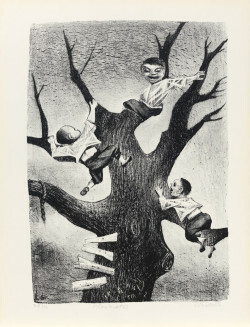 The scene initially appears benign: three children climb a tree on which a pair of lovers has carved their heart-framed initials. Closer inspection reveals these are rather malicious-looking children, with shaded eyes and expressions of malignant glee. The print discloses its secret through a disquieting punctum: a severed rope tied to a branch. In the 1930s Gropper, along with his comrades on the Left, contributed anti-lynching images to socialist journals and campaigned on behalf of the Scottsboro Boys. The dangling rope signals Gropper’s view of social relations in the United States—lynching gave the lie to the country’s claim to equal status for its citizens. 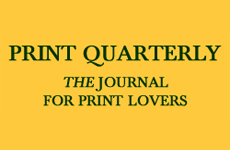 In such prints Gropper expresses the grotesquerie of human social relations—the hypocrisy, ambition, resentment and envy that characterize everyday interactions under capitalism. It was only a short step from a lynching tree to the Ladder of Success, an allegory of cannibalistic career climbing. A whirling vortex of figures, teeth bared and eyes flaring, scratch and claw their way toward the ladder—which remains ironically flimsy and out-of-reach. 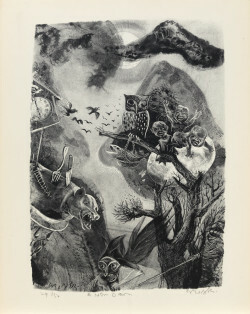 Capitalism’s failures are also invoked in his desolate Graveyard lithograph, which recalls the early years of the Great Depression, when there was no social safety net to catch the victims of economic devastation. 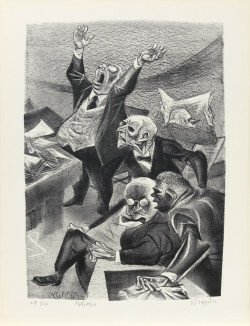 William Gropper, Informers from the portfolio The Capriccios (1953–56), lithograph, image 14 x 10 inches, sheet 16 1/4 x 12 1/4 inches. Image courtesy the Mary and Leigh Block Museum of Art, Northwestern University, Gift of Evelyn Salk in memory of her husband, Erwin A. Salk, 2001.21.28. The question may have prompted Gropper to recycle the theme and composition for Politicos, which bites deeper than the earlier painting. The subject is no longer a pot-bellied windbag surrounded by feckless work-shirkers: now the pyramid of senators in the print’s right-hand corner appear furtive and conspiratorial. Gropper has fitted them all with opaque glasses or depicted their deep, eyeless sockets, so that the positive ideal of “blind justice” is twisted into sightless cruelty. His theme has shifted from the Senate’s impotent indifference to its complicity in the injustices of the McCarthy era. Like Goya, whose airborne witches and winged creatures defy earthbound reality, Gropper frequently suspends the laws of gravity to depict a world without foundation, a terrifying rule-free void: bodies fly, flail or float, caught up in a maelstrom. Tornado and Uprooted convey his sense of a nation cut loose from its ethical moorings, tossing helplessly on social and political currents. In his youth Gropper had had faith in the power of the “masses” to rise up and demand equality and justice; in Capriccios he shows them buffeted by forces beyond their control. The titles Awakening and A New Dawn seem to promise a fresh start, but it may be the “clean slate” scrubbed fresh by catastrophe. The sun of A New Dawn is blotted out by clouds; a Boschian fish fixes its claws to a branch while a wolfish pig, skewered by a knife and fork, howls and a witch shrieks across the post-apocalyptic landscape. An egg nestled in a leafless tree hatches three baby-like humans whose scowling rage recalls the three tree-scampering children in Playmates. Through these Goyaesque grotesques, Gropper condenses the existential threat of nuclear holocaust. One of the most powerful and disturbing images from the portfolio is Nuclear Gods, in which he allegorizes nuclear warfare as hovering piranhas transformed, Godzillalike, into monstrous apparitions. These forlorn prophecies crystallize the most profound yet telling loss in the Capriccios; Gropper abandoned his mordant wit. His best political cartoons tempered indignation with humor, however bleak or bitter. The lithographs, on the other hand, are united by despair, as if the blacklist had crushed his fighting spirit as well as his career. This may be the portfolio’s most damning verdict on the McCarthy era: that it could turn a rebel and activist-artist into a fatalist, his vision unrelieved by hope. William Gropper, A New Dawn from the portfolio The Capriccios (1953–56), lithograph, image 13 7/8 x 10 inches, sheet 16 1/4 x 12 5/8 inches. Image courtesy the Mary and Leigh Block Museum of Art, Northwestern University, Gift of Evelyn Salk in memory of her husband, Erwin A. Salk, 2001.21.3. Even without Gropper’s characteristic humor, the Capriccios is a powerful act of protest, and constitutes the artist’s most sustained and ambitious statement in printmaking. 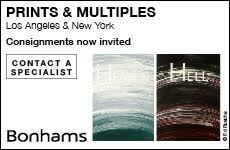 Yet the portfolio has been unjustly neglected, relegated to some scattered private collections and museum storerooms, unstudied and virtually unseen. The blacklist only partially explains Gropper’s fate. The triumph of Abstract Expressionist painting in the Cold War era swept aside a generation of artists like Gropper steeped in Marxism and committed to a partisan social viewpoint.14 In a time when abstraction was trumpeted as a progressive American answer to reactionary Soviet Social Realism, Gropper’s socially conscious homage to Goya’s Caprichos was aesthetically unfashionable and politically untenable. Today the portfolio stands as a vital primary source for understanding McCarthyism from the inside, as experienced by an artist who throughout his career held the machinery of justice and democracy accountable. The righteous fury fueling his vision of a corrupt sociopolitical system taps into contemporary angers and resentments, while exposing the historical complicity of the American government in propagating fear and failing to protect free speech. As an act of artistic witness, the Capriccios is not only a bracing condemnation of injustice, it is the summit of Gropper’s career: a fierce mix of social criticism, political satire and bleak pessimism.